In June 2017, after coming across numerous macro beers being marketed as authentic craft, Ireland Craft Beers came up an innovative and unique idea to bring integrity back to the craft beer industry. The idea was to brew our own beer which would be fully traceable and recorded on blockchain technology. 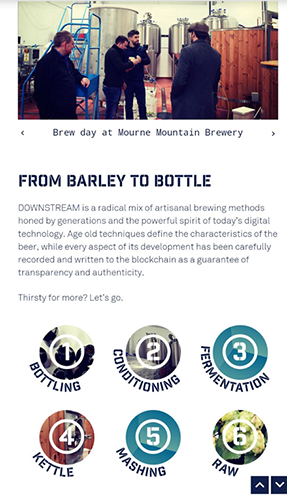 Introducing DOWNSTREAM, the latest beer to not only join the Irish craft beer scene, but the first blockchain beer using the same technology as bitcoin. To do this, we teamed up with arc-net, blockchain technology experts, who helped us create a solution that incorporates the same blockchain technology as bitcoin and offers significant advantages over manual and legacy systems in supply chain management, provenance, authenticity and compliance. 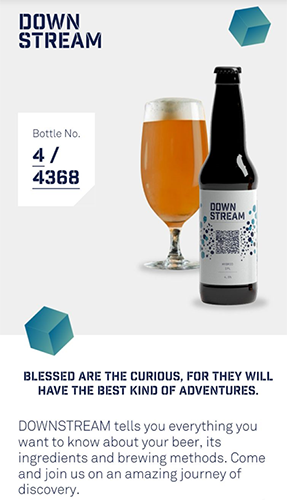 With arc-net’s blockchain technology and by using a simple scannable QR smart tag on the label, the consumer has the ability to uniquely identify every single bottle produced by bringing them to a webpage showcasing their bottle number and the option to give the consumer extra content to engage with. This level of verification and truth has created an exciting and integral product, now enabling all producers to utilize off the same in a similar light by bringing consumer trust through complete transparency. The first beer that we are launching is a Hybrid IPL (India Pale Lager). We brewed this beer in October at Mourne Mountains Brewery with the help of Head Brewer Tom Ray and Assistant Brewer Conor O’Hare. It is brewed with Simcoe Cryo hops to give it masses of tropical fruit, grapefruit and a sweet and sticky stone fruit aroma with a layer of pine. The colour leads you to think that the beer will be quite malty sweet, but the lager yeast has kept it very clean with the merest hint of roast malt in the background. We have already secured a listing for the new beer with our good friends and popular online retailor Honest Brew. 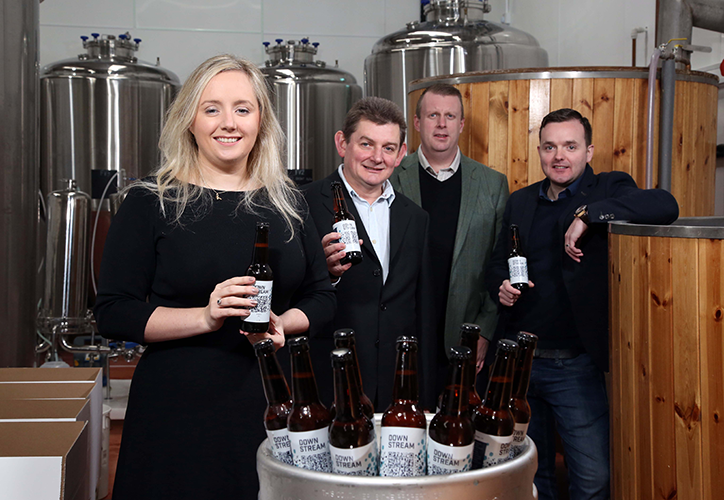 On top of this, it will also feature with a major multi-national retailer that is expected to stock another version of the beer in more than 400 stores across the UK in the coming months. 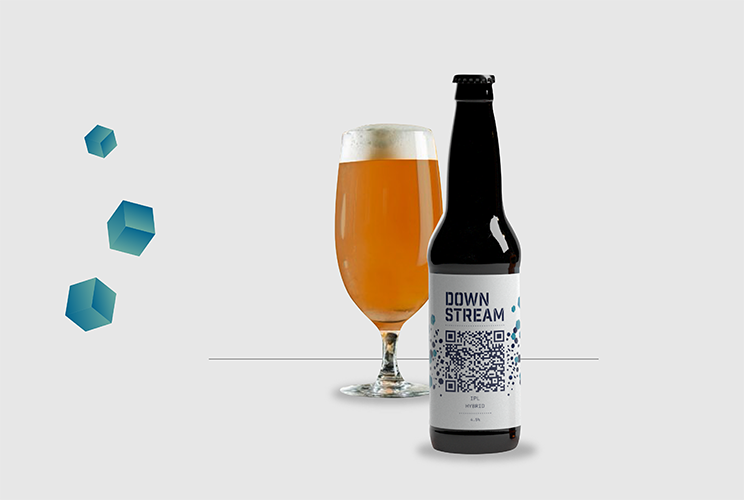 If you want to find out more about our DOWNSTREAM platform, please get in touch and be sure to check out our website www.down-stream.io.